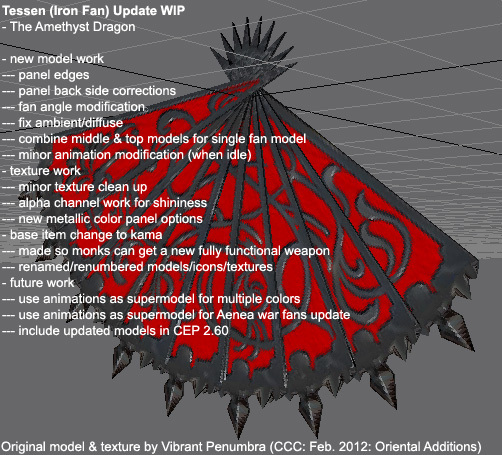 Back in February 2012, the Custom Content Challenge entries included a set of tessen (iron fans) by Vibrant Penumbra. Last night I was adding them to the CEP (for version 2.60), when I realized that they needed some work. "Some work" ended up taking hours as I modified the models and textures to my personal standards. So...yeah...tiny details nobody is going to see unless looking really close. Other details visible from a distance that just threw off the whole vibe, so I fixed them. Eventually I may be modifying the existing Aenea war fans to use the animations from these.